The SVTA Oxide MBE (Molecular Beam Epitaxy) system has been specifically developed to grow high quality superconducting films and metal oxide semiconducting materials. The growth module is designed to handle harsh active oxygen content and is equipped with an oxygen resistant substrate heater. 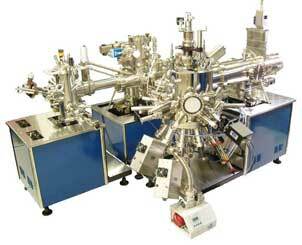 The oxygen species are generated by either an RF Plasma or Ozone Delivery Source. 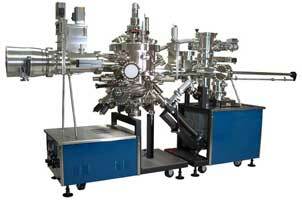 The base molecular beam epitaxy system consists of two modules: Epitaxy Growth Module and Load Lock/Buffer/Preparation Module. SVTA has standard and custom vacuum chambers which can incorporate multiple UHV Electron beam evaporators and effusion cells depending on your requirements. Transfers to chambers for surface analysis or other analytical techniques are available. The oxide MBE system comes standard in either a linear or right angle configuration; a "cluster tool" configuration is also available.